Freezing rain has persisted through the afternoon, with nearly one-quarter of an inch of ice buildup observed in Alpena. That amount of ice is enough to cause problems later tonight as wind speeds increase, such as tree limbs snapping and possible power outages. With ongoing ice buildup then rain changing to snow showers this evening, the National Weather Service is continuing a Winter Weather Advisory (shown in gray) for our area until 7 a.m. tomorrow morning. 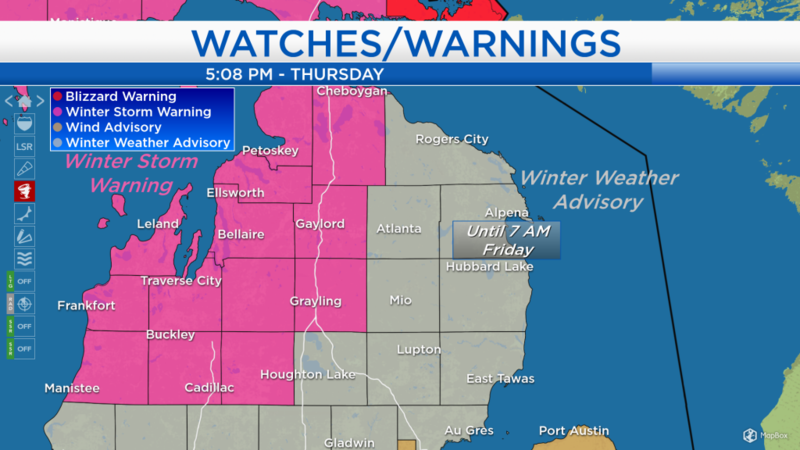 For areas close to and west of I-75, where lake effect snow and blowing snow will be more intense tomorrow, the National Weather Service is continuing a Winter Storm Warning (shown in pink) until 7 p.m. tomorrow evening. 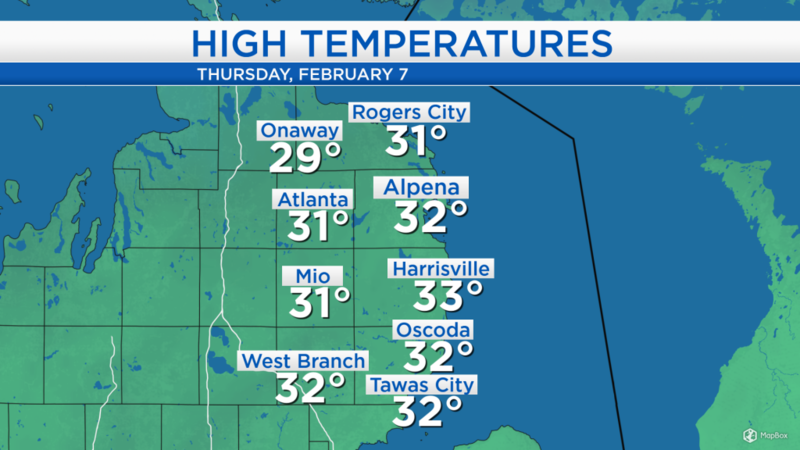 High temperatures as of 5 p.m. have reached close to the freezing mark across Northeast Michigan. The high temperatures for today will likely climb a few degrees above these values. Unusually, the high temperatures today will occur this evening. 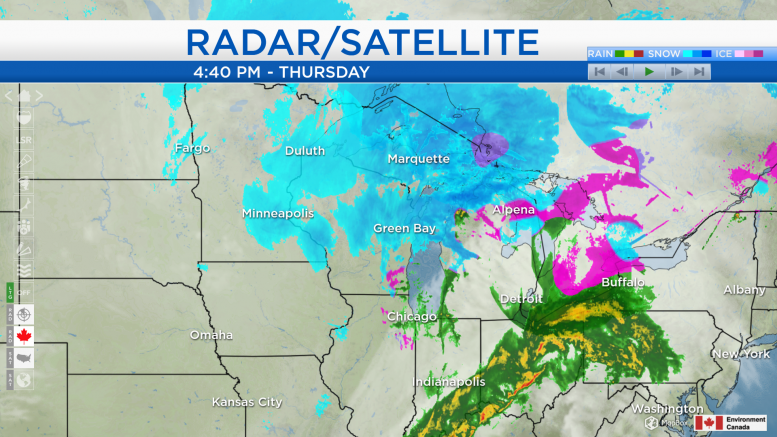 As the storm system departs, winds will flip out of the west, and that will bring dropping temperatures early tomorrow. Winds will increase to about 20 mph with gusts close to 30 mph, and temperatures will drop to about 14 degrees by early tomorrow morning. High temperatures midday will reach only about 18 degrees. Throughout tomorrow, there is a chance some light lake effect snow showers will reach our area, not nearly as intense as areas under the Winter Storm Warning (well to our west). 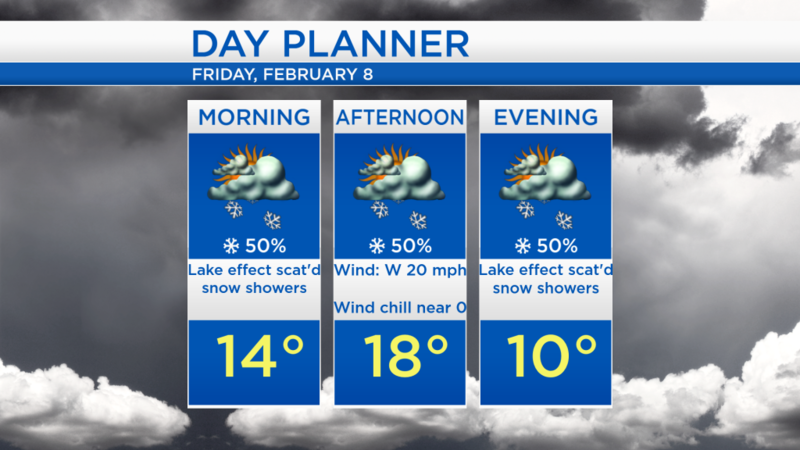 A few scattered snow showers are possible tomorrow with much colder temperatures only reaching the upper teens. Some sunshine will brighten our skies on Saturday with cold temperatures early then highs reaching the upper teens. A few light snow showers are possible Sunday evening, but until then, dry weather with highs around the middle 20s. For the rest of Northeast Michigan’s weather forecast, watch the latest weather video by clicking the weather tab at the top of the page.